In a fit of year end cleaning, I cleaned out the drawer in the end table next to where I generally sit and write. Amidst some pens, a magnifying glass, a few marbles, some empty seed packets, a few stray plant labels, a little book on Latin plant names, and some spare bulbs for Christmas tree lights, I found some notes scribbled on various pieces of paper – ideas for future blog posts, I assume. Some of the notes made sense and I could tell I’d already written something about them. Other notes were not quite as clear and I had to spend some time thinking about what I was thinking when I wrote some of this stuff down. I like closure, so I’ve decided to gather all these notes together and write one giant blog post about them. Monotypic. I thought a post about monotypic plants would be fun to write. A quick search of my blog reveals I did bring up the word “monotypic” on two other occasions, but I don’t think I used it correctly on one of those occasions, so I won’t link to it. But in a post about Viburnums, the subject of monotypic genuses came up. A monotypic genus has only one species in it, by the way. Now that would surely have been a fun blog post. Who can name the most monotypic genuses? Of course, everyone would rush to do an online search, and there would soon be a big ol’ list. Cheaters! 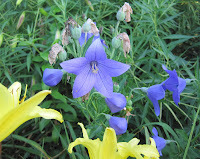 Some monotypic genuses that I know off the top of my head, and I promise I did not look them up, are Ginkgo biloba and Platycodon grandiflorus, commonly called balloon flower (and pictured above). Monophyletic. I looked this up and my head hurt reading about it. This would not make for a good blog post. I will throw this note away. Anacardiaceae. The cashew family of plants. I’m not sure what I was going to write about this one, though pistachios are one of my favorite tree nuts, and they are a member of this family. I did mention this family in a post I wrote about fragrant sumac. Maybe that is why I had this written down on a piece of paper and stashed it in the drawer of the end table? Pink Taurade. I’ll admit I had to look this up. Turns out it is a variety of Martagon lily. Did I order it? Did I see it somewhere and like it? Do I have a picture of it? Do I want one now that I see I wrote it down on a piece of paper? Guest post on guest posting by the garden fairies. Ever get those emails from people offering to write a guest post for your blog, promising all kinds of in-bound links? In exchange, you just need to let them have a few links in the guest post to whatever it is they are promoting. Don’t fall for it. Delete those emails as spam. Tip of the day. Only the garden fairies and Hortense Hoelove ever guest post on this blog, and occasionally Dr. Hortfreud helps with topics. And I have to ghost write for them, so it is all me, these 1,605 posts and counting. All me. Maybe it was all about having dreams and a vision for your garden? I’ll end with that, something to ponder as you tie up your own loose ends for this year, and this, my favorite end of year post about planting some goals. I have got to look up that Pink Taurade Lily. I was just thinking of the lilies I ordered and planted for next year. The only monotypic plant I can think of off the top of my head that you haven't mentioned is Heptacodium miconiodes. Love the proverb. My not-yet-written posts are collected as drafts in WordPress, not slips of paper. But I have the same trouble with some of them: what was I thinking? I enjoyed this blogger's miscellany very much, and I am going to add the Vita quote to my online collection. Hmm... I'm resisting the temptation to run off to a search engine to confirm my monotypic plant list. Rhodotypus scandens, I THINK... And with that I'm out. How depressing! At least you can read your handwriting. When I find old notes, I just squint at them and hope they say "bread, milk, eggs" and aren't a draft of the best post I've never written. Wonderfully eclectic, and +1 for loving the Vita quote. Wish I had a draw full of such enigmatic and interesting notes! Mine tend to be old reminders to read the meters, though I do tend to have lots of plant names, usually things I am thinking about growing... Happy New Year!